Norfolk Island is an isolated Polynesian country in the Pacific Ocean roughly halfway between New Caledonia and New Zealand. The island has a population of about 2300 and is a self-governing external territory of Australia. In addition to Norfolk Island itself, the country includes two small, uninhabited islands to the south. Norfolk Island is accessible by air, but it has no protected harbor; supplies must be offloaded to launches from ships standing offshore. The territory has no traditional lighthouses, but it has one beacon of interest to lighthouse fans. Admiralty numbers are from volume K of the Admiralty List of Lights & Fog Signals. U.S. NGA List numbers are from Publication 111. Date unknown. Active; focal plane 323 m (1060 ft); flash every 3.7 s, alternately white and green; also a red aircraft warning light, 1 s on, 0.5 s off. Approx. 8 m (26 ft) rotating aerobeacon mounted on a short square skeletal tower. A photo is at right, amateur radio operator G3TXF has a good photo (at the bottom of the page), Alex Wolfson has a 2018 street view, and Google has an indistinct satellite view. The Lighthouse Directory generally does not include aviation beacons, but this powerful light also functions as a landfall marine navigation light for the island. It has a listed range of 28 nautical miles (52 km or 32 mi). 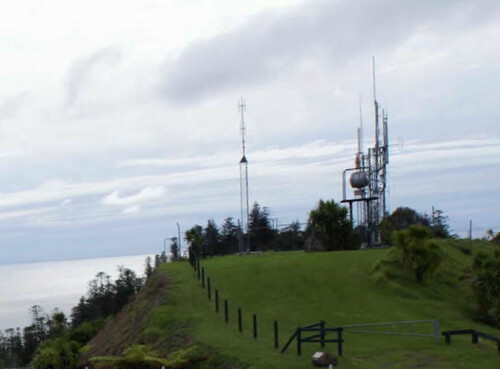 Located atop Mount Pitt, one of the highest points on the island. Accessible by road. Site open. Admiralty K4528; NGA 3740. Posted June 6, 2014. Checked and revised December 16, 2018. Lighthouses: 0. Site copyright 2018 Russ Rowlett and the University of North Carolina at Chapel Hill.